Today I am going to talk about BGP Next-Hop Behaviour With Multi-path Enabled.In default configuration, iBGP sessions preserve the next hop attribute learned from eBGP peers i.e. When a BGP speaker advertises the route to a BGP speaker located in its own autonomous system, the advertising speaker shall not modify the NEXT_HOP attribute associated with the route, unless we have next-hop-self neighbor command to force the router to advertise itself, rather than the external peer, as the next hop. 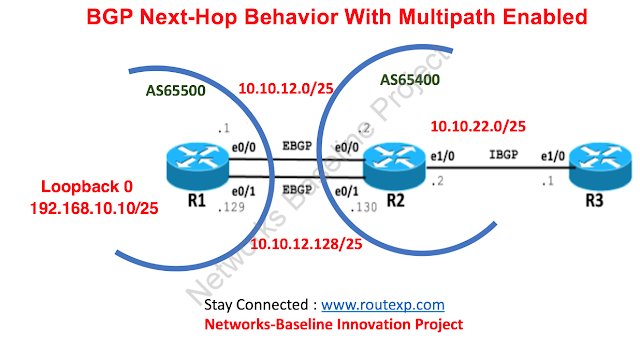 When we receive same subnet via multiple EBGP Neighbors on a device and we have BGP Multipath configured on it, then based on the BGP Selection Algorithm, multiple paths will be installed in the routing table. Thus the next hop value was changed by R2 while advertising the route to IBGP Peer R3, without any configuration to force the R2 to advertise itself as the next hop.